After gruesome days in office at last Krish and I decided to take a day off and packed our bags for our long weekend trip to Wales. Unlike Krish who did his masters in beautiful welsh university; it was my first encounter with majestic Welsh mountains and sea shores. My knowledge about Wales was limited to some unpronounceable names of places (I literally choke whenever I try to pronounce few place names in Welsh... Can you say Llanfairpwllgwyngyllgogerychwyrndrobwllllantysiliogogogoch, allegedly the world's longest name), The Prince of Wales (both the man and the most popular local pub names), gorgeous country sides, Welsh flag which featured a red dragon against green and white and few nasty welsh jokes. We spent three days driving along precariously winding, narrow Welsh roads enjoying the fresh air and lush green country sides, melodious Celtic language of locals in pubs and exploring walking paths in high mountains. At times, it felt as if I was in dream land. It was the much needed break for us which we enjoyed to the fullest. I even started coming to grips with some Welsh names (oh no!!! not the one I mentioned above) and some road signs (Allan means Exit ;). On a way back to home, we found few tables set near a farm land with few vegetables laid down. We being ultimate foodies couldn’t resist the temptation of buying fresh produce from farm. There were few bags of flat beans, box of cherry tomatoes which were the sweetest tomatoes I have ever tasted till now, a big marrow and gorgeous beetroots with greens. First thing I picked was the luscious beets because in my part of the world it’s not easy to get fresh beets with beautiful leaves. And moreover, I knew what I wanted to cook, my childhood favorite, Beetroot Kodhel with Beet Greens. Kodhel is a Mangalorean curry prepared by cooking in creamy coconut gravy spiced with hot red chillies and few spices. The ingredients used are minimal yet gives a rich look and taste to the curry. The gorgeous beets and beet greens gives bright red colour to the gravy and it is the reason why Beetroot Kodhel is every kids favorite. The sweetness of beets is well balanced with the spiciness of red chillies and aromatic coriander and cumin seeds take our taste bud through unforgettable journey. The recipe I am posting here is Kundapur version of Kodhel. Wash and clean the beetroots and greens. Peel beetroots and dice them into 1 inch squares. Chop beet green stems and greens into 1 inch pieces. Place beetroot pieces and stems in a deep bottomed pan and pour enough water till all the pieces are immersed in water. Add salt, jaggery and tamarind pulp and cook the beets in medium flame for 15 minutes. In a meanwhile, dry roast red chillies, coriander seeds, jeera and urad dal for around 1 minute on a medium flame till you get a nice aroma. Grind these roasted spices with grated coconut and onion with little water to very smooth paste. Add this ground masala and beet greens to the cooked beetroots and mix well. Cook this for another 15 minutes over a low-medium flame till the gravy starts to boil and thicken. For tempering, heat oil in a pan and add red chilli, mustard seeds and curry leaves in that order and transfer the tadka to the gravy when mustard starts to pop and splutter. Mix well and serve this delicious Kodhel with streamed rice, or idli or dosas. Betanins, a substance obtained from beetroot, are used industrially as red food colourants – e.g. to improve the colour of tomato paste, sauces, jams and ice cream. Cooked beetroot is a great source of folate that can protect you against high blood pressure, Alzheimer’s and dementia. Beetroot is virtually fat free and low in calories. It has an extremely low GL which means it’s converted into sugars very slowly which helps to keep blood sugar levels stable. Very nice dish, Sia. So is this like a gojju then? 'cos it has coconut, tamarind, jaggery. If not, what is the difference between a gojju and a kodhel? hey sia!! wow u indeed went to the most beautiful part of uk isin't it!! i am still struggling to say the world's longest name!! quite funny eh!!! love our dish!! Gr8 recipe and wonderful pics. wanna try it some time. Nice to read about Wales. Never been there before. The world's longest name was really funny to read. And, your kodhel looks really yummy. From your recipe, it looks like this dish is a combination of everything... sweet,hot and tangy .I've not eaten this before. Will try it for sure. Great kodhel recipe, Sups! and am glad you had such a fun time in Wales :). Fresh produce alsways works like a magnet na :-D.
Of course, Kodhel I love, never tried it with beets. Another idea for me.Thank you. Happy Dasara.Eat well and sleep like emme, as you said once! Hahaha!! i've been to wales. gorgeous gorgeous place. i want to go again. beetroot means, something which I could squish with my rice and turn my hands and rice to a nice bright colour :))) your welsh trip sounds like a perfect weekend . yum yum! i love beets and will make ur recipe next time i buy them...i always felt when the welsh spoke english and you were unable to see who was talking...you may think a desi with a mid-change U.S accent is speaking...at-least in my experience.. Awesome! will definitely give it a try! I have had different kodels but not beet... have beets at home and will try this soon. Thanks Sia. Gruesome days at office, eh? You have a gift for using the right words. The beetroot curry pic is nice. That beet dish looks yummy. Glad to hear that you had good fun. Sia, good for you, nothing like a spur of the moment packing of the bags, never been to Wales or Scotland or any of those beautiful places, don't know if we will any time soon but the Beet Kodhel is something I can try right away, have all the ingr. with me. We went to Cymru(doesn't that stand for Wales ?) a couple of years ago and still can't forget the beautiful landscape...nice to know you enjoyed your holiday...and yes, we too had fun trying to read those unpronounceable names. am i imagining things or is that a carved flower on top of the beet? Sia u have a lovely blog, my first time here, ur description makes all of us want to visit Wales,wish u had posted some pics. I have a love-hate relationship with beet - and a love-love relationship with Wales, especially Swansea and Cardiff. Have you been over both the Severn river bridges? I love beet salad - you know the one where you cook and peel the beets, slice them and then bottle them up with spice-infused vinegar? I don't like it in kooras much though, and beet poriyal is something I eat only reluctantly. Your recipe however sounds wonderful - I will have to keep it on my list of things to try. BTW, the info abt beets is very useful! Thanks for sharing! ur beet kodel looks yum. Hope U enjoyed ur vactaion. And Kodhel is looking very healthy. I will try this never tried this way. Hey Sweetie, how you doing? Sounds like you enjoyed your vacation. Just so you know, I can read all the way across your post (middle column). Thats really some name to spell. Very interesting read about your vaccation. Beet kodhel looks yummy. 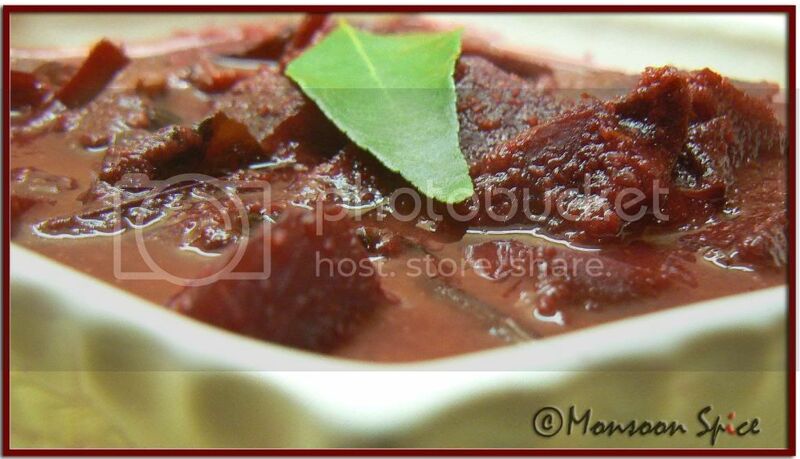 Loved your kodhel recipe and as you said what a coincidence that we both posted beet recipes. Yay! Now you've given me many more reasons to justify my love for beets :) This looks yummy, I'm definitely trying this out the next time I get my hands on some beets. Wales sounds really cool, guess I should be adding it to my travel list! Iam visiting u after a long time Sia and ur new monsoon spice looks very nice ... the look , the template the colours all look cool. nice job girl. beet kodhel looks good and is different from the way i make. thanks for the rcipe. 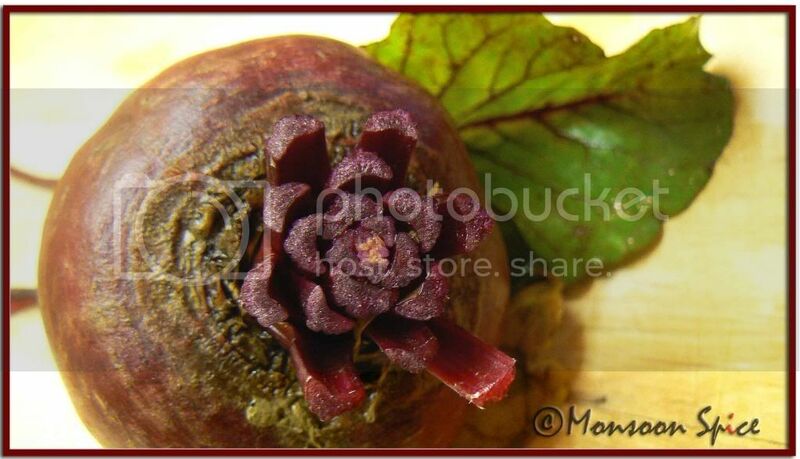 Beetroot pic is awesome.I have some beets will definitely try urs! need to publish this sia..just for your info..
last time I had to trouble getting in..
Looks really nice sia. Lovely dish. Happy Dussehra to both of u.
I love the new look!!! The welsh names and the beetroot kodhel sounds great! Glad you had a nice time. I love beets too! there r many variations in gojju. gojju can be in cooked form or raw. some gojjus r curd(yogurt) based where as others r coconut based. i hope this helps tbc:) i am not sure if its 100% right info and would love to hear from others too. sorry for what? anyways when we share share recipes it becomes ours;) rt? if u get a chance visit wales and scotland kribha coz i feel they r one of the most beautiful places in the world. u r right. 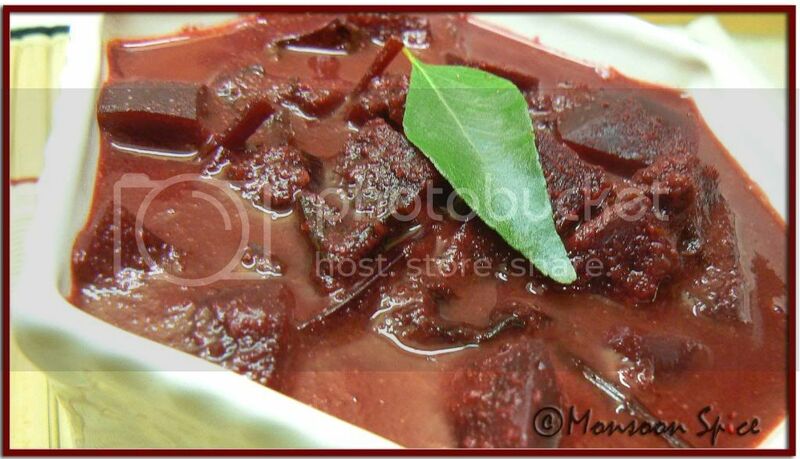 usually i use cooked beets we get from supermarket but the bright red colour u get from fresh beet is uncomparable. so u were in wales then? yup, countrysides r so beautiful here, just as we read in most of the fairy tales:) have u been to lake district? thats another place i love. hope u get to visit wales very soon. checked ur post. u r on a mission to tempt me all the way hah? UK countryside is beautiful isn't it? do let me know when u try it. Cymru is welsh name for wales. the names r quite funny as they r pronounced differently to the way they r written. but the place is breath taking. nope, its actually beet stems chopped off. it does look like a flower isn't it? i still have to visit cardiff and swansea and they r in top of our list, especially swansea for special reason. i grew up loving beets and started hating it in my teens but now again i love it. have u tried adding cooked beet puree to chapati atta? it not only gives fab colour ut tastes gr8. try it even if u r not a big beet fan and even kodhel works really good. thanks rmya and do try this recipe. u can omit onion. grinding onion with spices is kundapurian way of making kodhel. usually my mom either fries onion slices or she just add raw onion slices directly with ground masala and cook. IMO ground onion actually enhances the flavour and if its upto u to add or leave them. hope ur PC prob is resolved and u get bk to blogging soon. do post ur kodhel recipe. thanks girl. ur comment is much appreciated. i have fixed the prob now and hopefully comment link is working fine now. we visited northern wales and just touched Snowdonia border. planning to visit someother places soon. This is just what I was looking for.. great recipe, great pictures and most importantly great taste too! loved it, astonished to see that this was posted 4 long years ago... Thanks Sia for the recipe, my taste buds thank u! my taste buds say "Great one for the day", went well with rice! nice pictures too.. thank u Sia.